Who was Myrtie Law… and what happened to her? A family mystery: who was Myrtie Law… and what happened to her? But there is one thing more we think we know about Sarah Jane. We think she had a daughter. And that presents the family history mystery I’m struggling with today. Now I know that a Mertie or Myrtie Henson married C.D. 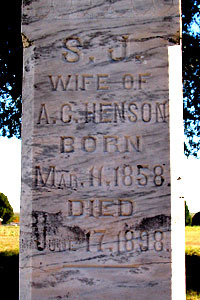 Robinson on 20 March 1900 in Wichita County, Texas.8 Charles and Mertie Robinson were recorded on the 1900 census in Wichita County.9 Not a sure bet, of course, since Texas marriage records didn’t list parents’ identities, but it would sure make sense that Aaron would have settled some sum of money on the daughter of his first marriage when that daughter married — and just before his own second marriage. But… and there’s always a but, isn’t there? … it’s not an exact match. Aaron was born in Kentucky; Mertie Robinson’s father was recorded in the 1900 census as born in Texas. Aaron and Sarah Jane had no children in the 1880 census (remember, it had an enumeration date of 1 June 188010 and was actually recorded, according to the census page, on 2 June11); Mertie Robinson was recorded in 1900 as born in May 1880. True, Wichita County wasn’t exactly densely populated in 190012 and there were only two Henson families in the whole county,13 but there’s still a real risk of making an unfounded “same name therefore same person” assumption. And it’s not a lot of help anyway since both Charles and Mertie (Henson) Robinson are gone by 1910. No clue as to their whereabouts. At some point between 1900 and 1917, when Aaron wrote the will, his daughter Myrtie had to have married someone named Law. Can’t find a death record for Charles Robinson that would have freed that Myrtie to marry again. Can’t find a marriage record in Texas for a Myrtie Robinson or for Myrtie Henson or for a Law marrying a Myrtie or Myrtle or… And talk about striking out — I can’t even find a decent candidate attached to even the worst reasoned, least documented personal family tree on Ancestry. I’m at a loss. Where else do I look? Are you a Law, or a Henson? Do you know — can you tell me — who was Myrtie Law… and what happened to her? What a mystery! Hope you find a distant cousin with some wonderful documentation, or even just a glimmer of oral history taking you somewhere quite different! It’s almost as if she disappeared into thin air, Celia. It’s probably a matter of disappearing into a new married name or something, but at this point, I don’t even know where to start looking. Well, you can probably cross off the one who died in 1957. Her husband’s obit is on his memorial at findagrave.com, and her maiden name was Grey. See Thaddeus Van Horn Law and Myrtle Grey Law in the Oleander Cemetery, Galveston, TX. Clearly there are more tax records than have been scanned and placed on FamilySearch. (This is the norm for Texas tax records.) If Robinson shows up in 1900 or before, unless they moved, he will be on the rolls until his death. I’m sure you will take the time to look at each page, but for others not familiar with Texas tax rolls–if someone died, their estate can show up under the appointed or an unappointed administrator. So, if C. D. Robinson disappears and you don’t know if he moved, you need to begin looking under every other name. (Hopefully, he owned land. You didn’t discuss land, which is a puzzle.) Names can drop off and show up again. It is helpful to look at several years to get an idea of how consistent the information for any one county is. You should also be aware that some of the Texas tax records did not end up under the correct county on FamilySearch. A stray year from another county pops up now and then. So if you are missing a year, it may have wandered into East Texas. I wouldn’t cross the border unless you have looked for “Robinson” and “Law” through all the filmed tax rolls. Parker County tax rolls through 1896 are also on FamilySearch and the remaining rolls can also be ordered from the state. It doesn’t make up for the missing census, but it helps. See 1910 census–Charly D. Roberson, age 30, in Harrold, Wilbarger, Texas, with with wife Murtie C. Roberson, age 28, and daughter Sybil, age 6, all born TX. First marriage for both Charly and Murtie, married 10 years. Her parents are said to both be born KY. Forward to 1920 census–Charles D Robinson, age 43, in Burkburnett, Wichita, Texas, with wife Maggie, age 27, born Kansas, and daughter Sybil, age 15, and son Charlie, age 11. Also see WW1 Draft Registration Card for Charley Davis Robinson, b. 24 May 1875, in Wichita, TX. Nearest relative is Maggie Robinson. Date of registration is Sep 1918. So Mertie/Murtie wife of Charley is gone after 15 Apr 1910 and for sure by Sep 1918. Can’t tell yet who the son Charlie belongs to in order to narrow the time frame. Looks like Sybil Robinson marries a J. H. Bowman in 1922 in Wichita. She died in 1967, same place, and wouldn’t you know, mother is unknown! So findagrave has Sybil Robinson Bowman’s mother as Mertie Henson. The memorial has the familysearch.org indexing info copied and pasted into the memorial. It says her mother was Mertie Henson, but the original indexing does not and neither does the death certificate itself. Sybil’s in the Burkburnett Cemetery in Wichita Co. Her father is there too as Charles David Robinson, died 1954. Oh, forgot to say that Charlie D. or O. Roberson and Maggie are still in Burkburnett in 1930. No children present. YOWZA!!! You guys are terrific!!! Off to track down the Wilbarger and later records. This puts a whole different face on things — not just estranged from her father Aaron Henson, but her daughter in the custody of an ex? Oh my. THANKS, Laurie! And Rondina, the Texas tax records were the first thing I checked, and it looks like I may have let myself get trapped in the Robinson – Robeson – Roberson – Robertson issue I’ve tripped over before. Thanks! Charlie, the son, appears to belong to Maggie, the second wife, because the census in 1920 indicates his father is from Texas (Charles? But he was still married to Mertie in 1910!) and his mother is from Kansas, which Maggie is. Sybil’s mother is from Texas. If it was Charles, then perhaps that’s why Mertie Henson Robinson got a divorce — if she got one. I agree that it looks like the boy is Maggie’s, not Myrtie’s (I’m using that spelling since her father did in his will — and I figure he should know better than I would!). There are more questions being opened here as well. Thanks to information from a very helpful FindaGrave poster, it appears that psychiatric illness may have played a role with this family as well. Just because I don’t know anything about this family does not preclude me from jumping in. 🙂 I wanted to remind everyone that Probate Records are absolutely wonderful and can really establish a lot of connections. It is worth a phone call to the Circuit Court offices of the local counties to determine their policies. I have had pleasant clerks look things up while I wait on the phone, send the results to me, electronically at times and via snail mail in other cases. The reason that I say it is important to phone ahead is that one county that I know about really does not want to have visits from Genealogists on any work day except Friday when their County Court in not in session because there is way too much work to do M-Th. So remember this helpful office with its myriad of all sorts of records that provide a picture of the lives of our ancestors, as well as of their parents, their siblings and their cousins. Our ancestors get mentioned in those records as well from time to time. Great comment, Cheryl — and your point about calling ahead to the clerk’s office is such a good one! When we try to accommodate the folks who have the records, they sure help accommodate us! And for that we are most grateful. I’m doing research for a great granddaughter of Aaron Crosby Henson so I’m also looking for Myrtie Henson and her family. I found Myrtie Law on the same 1920 census as you and then I think I found her on the 1930 census Anadarko, OK, with husband, James White, and son, Raymond Law (listed as James’ stepson). She is listed as Edith M. There is a Frank Law buried in the Memory Lane Cemetery (Anadarko, Caddo County, OK) b. 1885, d. 1929 which would match these census records. I also found a death certificate for a Myrtle White (http://genealogy.az.gov/azdeath/0223/02231933.pdf) born in TX, father Aaron Crosby Henson and the informant on the death certificate is Raymond F. Law. Death certificate states Myrtle had been in AZ for 21 years so this would kind of match the pattern. I found a Raymond F. Law (sp. Evelyn) living in Phoenix in 1948. I’ll continue to search and pass along my findings to see if you think these match this family. Debi, that’s fabulous. I also managed to get Raymond Law’s SS5 and it too says he was the son of Myrtie nee Henson. So we’ve got this nailed down, except that Raymond didn’t know that Myrtie’s mother was my great grandfather’s sister. Raymond, by the way, served time in federal prison for forgery in 1937 (records on Ancestry); he listed Myrtle White of Phoenix as his closest relative. Wow, I didn’t find that record on Raymond, however, I will go look it up. I found this website and it appears that a Raymond F. Law was a writer for “The Desert Magazine” in the late 1930s-1940s. I’ll keep looking for information. Feel free to email me if you wish. http://www.scribd.com/dm1937/d/2095272/4-By-RAYMOND-F-LAW (Buffalo Hunt in Arizona) Not sure if this is the correct person — can’t find anything on this author. Yes, that’s the one I have. I will email you the link to the prison information. It was so interesting to read about your getting info on former Hensons, all of my Henson kin came from S.C.,we’ve been able to get back to Richard circa 1700,my father moved to Tn.,so we knew very little about his heritage,so missed out on a lot,Mertie could have been adopted,alot of children were taken in by kin,hope you can find out even more.